Pulling aside the curtain to reveal how the wizard works « Hercules and the umpire. This will begin an intermittent series of posts regarding jury trials. The posts will hopefully provide some food for thought on what really goes on with regard to jury trials in the federal courts. Let’s start before the lawyers arrive to select the jury. In virtually all federal courts, there is some sort of orientation, although how the orientations are conducted varies widely. Over the last several decades, I have taken a very hands-on approach to jury orientation, and some might think my approach is unusual. Anyway, here’s how I do it. Initially, the prospective jurors see personnel from the Clerk’s office and are checked in. They receive a briefing on practical things–like where to park–and sometimes are shown a video. Then, they are brought to me. I conduct my orientations in the courtroom where the trial will be held. The lawyers are welcome to attend, but not participate. The session is entirely informal and relaxed, and no recording is made. I begin the orientation with a short talk. I try to answer these questions: What’s the constitutional reason for your being here? How did you get on the list? How is the typical jury trial conducted? I explain voir dire, opening statements, witness examinations, and closing arguments. I explain the burden of proof, who goes first and last and why that is so. I tell the jurors not to worry about their safety, and explain that my name, telephone number and address are in the telephone book. I explain what would happen if we had a security concern. I explain how long they will serve, and our hours of work during trial. I then have the jurors get up and walk with me into the middle of the courtroom. We gather around the lawyers’ tables and peek into the computer hook ups, we examine the video screens, and push the “on” and “off” buttons on the microphones. The jurors are told about interpreters and shown how the interpreters use the equipment situated next to the defense table. The jurors will then see where the Marshals will sit if we are trying a criminal case. We also talk about the roving Court Security Officers who will periodically enter the back of the courtroom and the fact that the CSO’s have earphones. We show the jurors the camera that the United States Marshals Service uses to monitor the courtroom. We also explain that since we are a pilot court for video recording, we have the capacity to video record trials. Since the cameras are apparent, we tell the jurors whether the trial will be recorded or not. If a video recording of a civil trial was expected, we would go into detail about camera angles, juror privacy and the uploading process. We would turn on the video equipment and show the prospective jurors what a recording looks like. 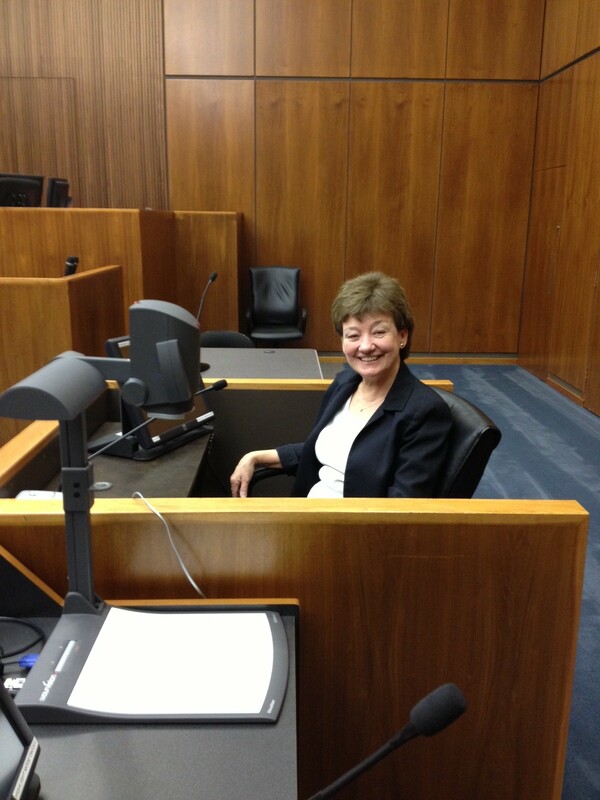 Colleen, our courtroom deputy supervisor, sits in the witness-box to illustrate to the prospective jurors how the equipment works. The prospective jury panel gathers around her as she illustrates. I yap. Next, we walk over to and look into the witness-box. The courtroom deputy (CRD) serves as a model and sits in the witness chair. She manipulates the flat screen that permits the witness to draw things and display the drawing to the jury, the CRD explains the need for the witness to be close to the microphone, and she illustrates how the video presentation equipment (adjacent to the witness-box) can be used by the witness and a lawyer. We then walk over to the locked door where the Marshals will bring in prisoners. The jurors are told about the holding cells that are maintained in the middle of the building. After that, we walk onto the clerk’s bench. The CRD then shows the jurors her computer equipment, her timing equipment, her digital audio monitoring equipment and so forth. Juror are told that we can provide them with battery operated headphones during trial to better hear soft-spoken people. The head phones are demonstrated. Digital audio recording rather than a court reporter is explained. 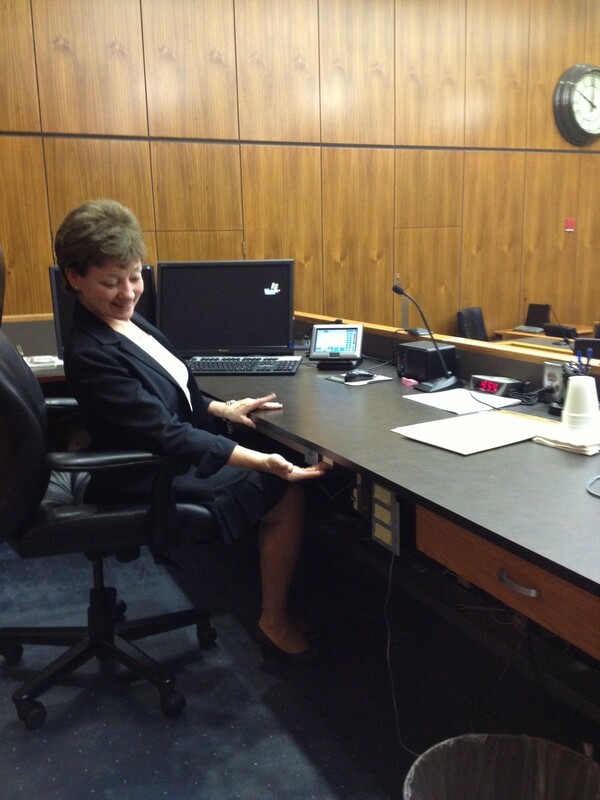 Colleen, our courtroom deputy supervisor, shows prospective jurors the equipment she operates during trial. This is pretty much the view that the prospective jurors get when they walk onto the clerk’s bench. After that, 14 jurors are asked to sit in the jury-box to “test out the chairs.” Use of the flat screens in the box as well as a large additional flat screen is explained. The other prospective panel members gather around the jury-box. We then walk up the stairs to the judge’s bench. We can accommodate 17 jurors at a time. The CRD sits in my seat and shows the jurors the computer equipment, panic alarm button, and toggle switches for the lights. We talk about bench conferences, the reasons for them, and the “white noise” that will be pumped in when a bench conference occurs. View from the judge’s bench. All the prospective jurors go up on the bench during orientation and see what I see. After all the jurors have gone up on the bench and looked around, we then go through the recessed door in the wood paneling where I enter and exit the bench. We go down the steps behind the courtroom and into the jury deliberation room. In the jury deliberation room, we talk about coffee, the refrigerator and the microwave, where the restrooms are located, the need for jurors to wear their identification badges while in the courthouse, use of the telephone and other practical things. I explain why I don’t allow jurors to ask questions of witnesses during the trial whether orally or in writing. We then proceed single file into the courtroom through the “jury’s door” just as they would go if trial were in session. 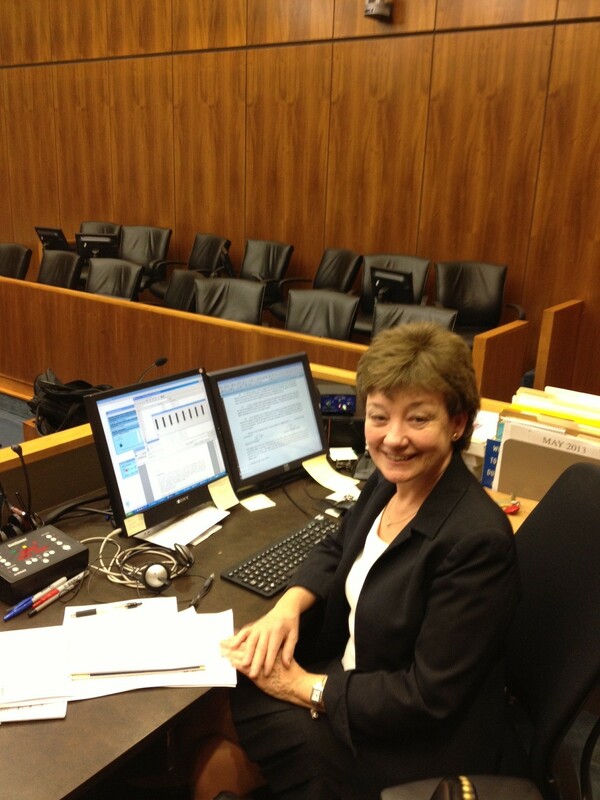 Colleen, our courtroom deputy supervisor, sits in the judge’s chair on the bench. She shows the”panic alarm” and other “secrets” to prospective jurors while I provide the narrative. Every prospective panel member goes onto the judge’s bench. During all this time, I provide a running narrative of what the jurors are seeing and why they are seeing it. I try to keep the talk light, and humorous but informative. My mission is to make sure that when jury selection and the trial begin that the jurors are concentrating on important stuff rather than their physical surroundings. In short, that’s how I do a jury orientation. Is it worth the time and effort? I know this, after I discharge jurors following the trial, I meet with them privately. I have conducted these interviews for every jury trial I have ever conducted over the last 26 years or so. I always ask how I could do a better job. Almost without exception, jurors tell me that the “walk about” was the highlight and I should never drop it. They say it reassured them, helped them understand and visualize the process and made them feel comfortable. Interesting. All the “indoctrination” that you do re: burden of proof, witness examinations, etc., are done on the record here in CT. But then again, we have individual sequestered voir dire for all criminal cases, so I expect the experience is quite different than in Federal Court. The indoctrination about burden of proof and related topics that you speak about is repeated again, and on the record, when I give the jury my preliminary jury instructions prior to opening statements. I also speak about these things during orientation (but in simple terms) so the jury can make sense out of the orientation. For example, if I tell the jury during orientation that the government will go first, the natural question is: Why? Thanks for your comment. All the best. Then I suspect that part of your practice has much in common with what I know judges here do. Thanks. Very cool. I’ve sat on county and city juries in New Mexico and Texas; what we got in the way of orientation was a pro forma speech about our duty as jurors and thanks for our commitment. On the other hand, our courtrooms are nowhere near as high-tech as yours. Do all Federal courts have courtroom deputies? What do they do? The local trials on which I’ve sat haven’t been complex. 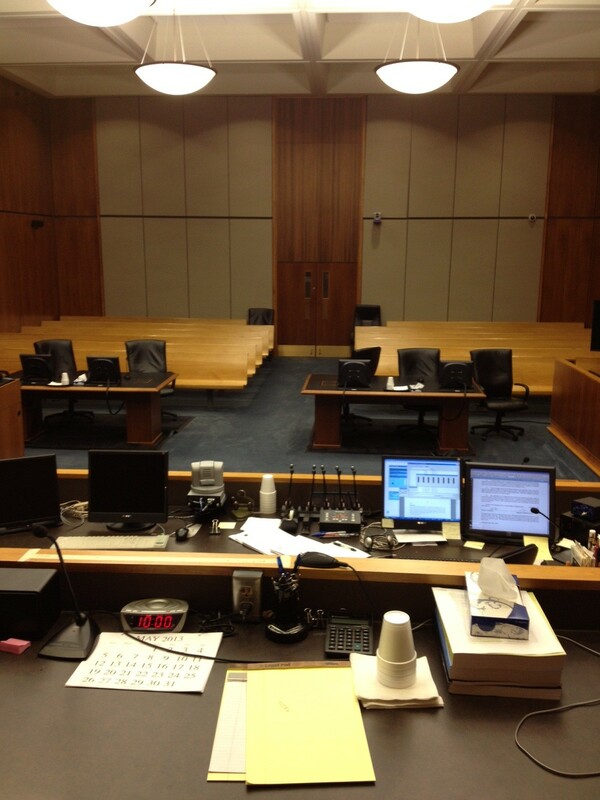 Think of the courtroom deputy as a manager in the courtroom and outside the courtroom as well. I think most federal trial courts use courtroom deputies (CRDs). Outside the courtroom, my CRD has case management responsibilities. For example, the CRD looks after computer generated motion lists to make sure we are getting our work out promptly. She compiles various and sundry other reports that are used both internally and also submitted to the Administrative Office of the US Courts in Washington. For example, jury utilization statistics (detailing whether we are summoning too many jurors) are compiled with the help of the CRD and sent to Washington. I hope this gives you a sense of what CRDs do. All the best. She looks busy. And all you have to do is sit around in a black robe, looking official. Pingback: Limiting the participation of counsel during jury selection (or how to make a lawyer’s head explode) « Hercules and the umpire. Fascinating. I don’t know any trial judge who does anything similar. Breaking it down this way has to be very effective in getting buy-in and attention. It also has to be one of the best ways of emphasizing the critical value of the jury system. On the downside, it highlights the extreme difference in resources between the federal and state court systems. To those of us in the trenches, our federal courthouses can feel like luxurious temples of justice. The county courthouse just a block away is closer to homeless shelters. That said, your orientation work is fabulous. Hope your colleagues read this post.